Wolfenstein II for the Nintendo Switch, originally created by Bethesda and ported by Panic Button, is a constant tug-of-war between intense moments that leave you wanting more, and instances that…well…make you just want to drop your controller on the ground and leave the experience altogether. Between the awesome and action-packed gunfights and the sadly random bugs that killed all immersion whatsoever, Wolfenstein II is truly a hit-and-miss game for the Nintendo Switch that might be best served on other platforms. The setting for Wolfenstein II is somewhat generic but gives players another chance in an alternative reality to kick the living crap out of nazis. The evil force of individuals have instead defeated the allied troops in World War II and have taken over the United States of America. That said, it’s up to the one and only nazi killing machine, William “BJ” Blazkowicz to end the rise of the despicable empire – along with the help of his reliable group of friends, of course. Wolfenstein II is very much like Doom for the Nintendo Switch: It’s completely filled with bullet-spraying action, but it also grants players the opportunity to wield two guns at the same time. Crazy and at times often scary pop-up moments occur in this game, which only make you wanting more of the action, and it’s times as such which really make Wolfenstein II shine very bright. It’s an awesome game in this regard, it’s especially fun ripping nazis apart with your axe in up-close and personal melee encounters. But there’s also a downside to the intensity as well, and that’s when bugs appear. Although quite random, Wolfenstein II has some very noticeable and often game-breaking bugs. For instance, collecting scatter items and collectibles in games can be an awesome pastime – it could extend the amount of time playing the game and some people solely live to play games to grab hidden items. But I did, however, run into a particular instance which involved collecting a hidden item, only to have the game completely freeze in place. I’m not one to grab items scattered throughout video games, but running into this problem did not encourage me to look deeper for additional items. Another bug in Wolfenstein II has been made apparent, albeit random as well, when pausing the game. For example, when you pause the game for whatever reason, you are unable to browse through the game menus. This was initially scary, but I recently reached out to Bethesda PR and was told by a representative that one should completely restart their system in order to remedy the problem. I’m happy to report that the trick to fix the game does indeed work, and it’s also worth noting that Bethesda PR has mentioned developers are working on a big patch which aims to address any problems. Even though it has its fair share of flaws, Panic Button certainly did a wonderful job porting Wolfenstein II over to the Nintendo Switch. Within the visual department, things are looking decent while running in-game, although colors are noticeably botched when compared to rival platforms like the Xbox One, PlayStation 4, and PC. To its credit, however, cinematic cutscenes, which are quite lengthy at times, look beautiful in both docked and portable modes. Wolfenstein II is an awesome shooter, probably one of the best first person shooters I’ve played this console generation. But I do think this game would be best served on other platforms which support better visuals and have had time to address things like in-game bugs. Although the premise is certainly generic, the fine folks at Bethesda and Panic Button have done a wonderful job placing gamers into the role of BJ Blazkowicz. Gunplay is definitely solid, and the ability to dual-wield guns, along with the chance to control futuristic weaponry, feels great. 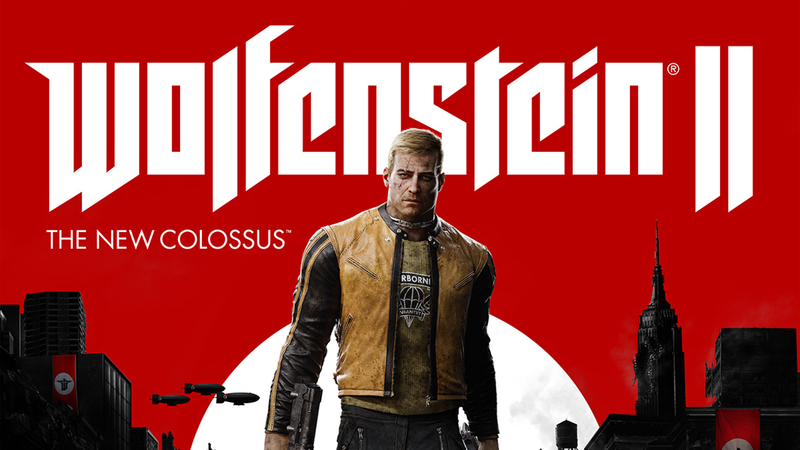 But things like game-breaking bugs, which again can be random, do exist at this moment in time, which if you aim to avoid them, you might want to wait to pick up Wolfenstein II on the Nintendo Switch until Panic Button have released a new patch. Wolfenstein II for the Nintendo Switch is action-packed and full of awesome Nazi killing. But a few things hold the game back from reaching its full potential on the latest Nintendo platform, which makes it a little more ideal to play the game on other supported consoles if you have them available.